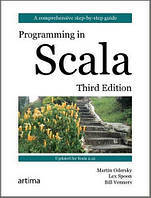 Scala is an object-oriented programming language for the Java VirtualMachine. In addition to being object-oriented, Scala is also afunctional language, and combines the best approaches to OO andfunctional programming. In Italian, Scala means a stairway, or steps. Indeed, Scala lets you step up to a programming environment that incorporates some of the best recent thinking in programming language design while also letting youuse all your existing Java code. Artima is very pleased to publish a new edition of the best-sellingbook on Scala, written by the designer of the language, Martin Odersky.Co-authored by Lex Spoon and Bill Venners, this book takes astep-by-step tutorial approach to teaching you Scala. Starting with thefundamental elements of the language, Programming in Scala introducesfunctional programming from the practitioner's perspective, anddescribes advanced language features that can make you a better, moreproductive developer.